DIY: A traditional mix of pine cones and berries is used to decorate a purchased wreath in this simple wreath-making design. 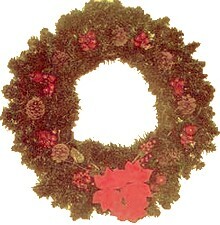 This wreath is very easy and takes a very short time to assemble. Referring to the photo for placement, attach pine cones using floral wire. Wrap wire around your cone and then wrap that wire to the frame of the wreath. Space your cones evenly and then wire your berry bunches to the wreath, in the same manner, placing them in between the pine cones. Wire a ribbon of your choice to the center bottom and you’re all done.